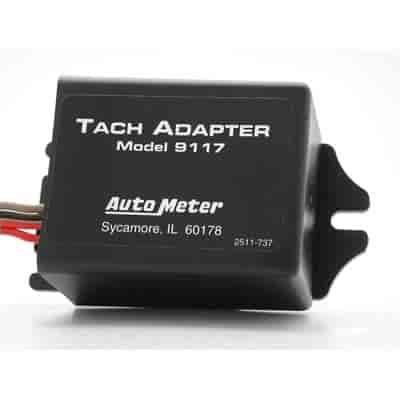 This Tach adapter will allow you to connect a tachometer, shift light or RPM activated switch to a distributorless ignition system (Including 1999 and newer Ford Mustangs). This adapter senses the current from the positive coil source wire and converts it into a 12-volt square wave signal that can be read by Auto Meter Tachs and accessories. Compact and completely potted in polyurethane for vibration and moisture protection. 9117 - Auto Meter Tach Adapter, Signal Converter & Accessories is rated 5.0 out of 5 by 1. Rated 5 out of 5 by Nightmist66 from Simple and Effective This worked perfectly to install my new Ford Racing tach in my 03 Crown Vic. Intsructions were clear and simple. Works great!